If you want to know all about crayons I’m the pug to talk to. I know everything about crayons because I have eaten so many of them. Many people have asked me what the meaning of crayons is and it is simple and very clear. Crayons are for eating! Crayons are one of the best tasting things other than food or chicken. I like chicken. There are lots of crayons at my house because my human puppys use them all the time for coloring. For some reason they don’t eat them. If only they knew what they were missing out on. Luckily for me they also leave them all over the floor and that’s how I eat them. 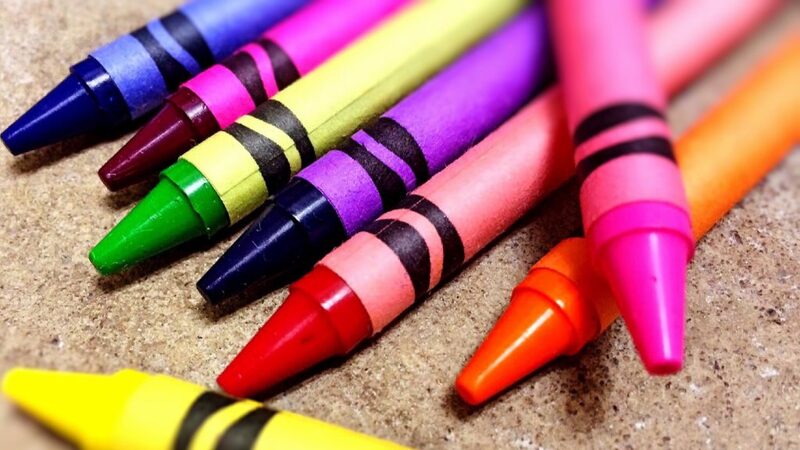 Crayons come in many different colors. Red, orange, blue, green the list goes on and on. Surprisingly and disappointingly they don’t have different tastes when their color varies. My sister Loretta tells me that eating crayons is disgusting and that it’s bad for my teeth. I don’t listen to her though (plus I’m already am missing most of my teeth). As you can see crayons are a very tasty and colorful way to fill your tummy. They will never be as tasty as chicken though I like chicken. The beach is used to keep dogs happy the meaning of everything of course. 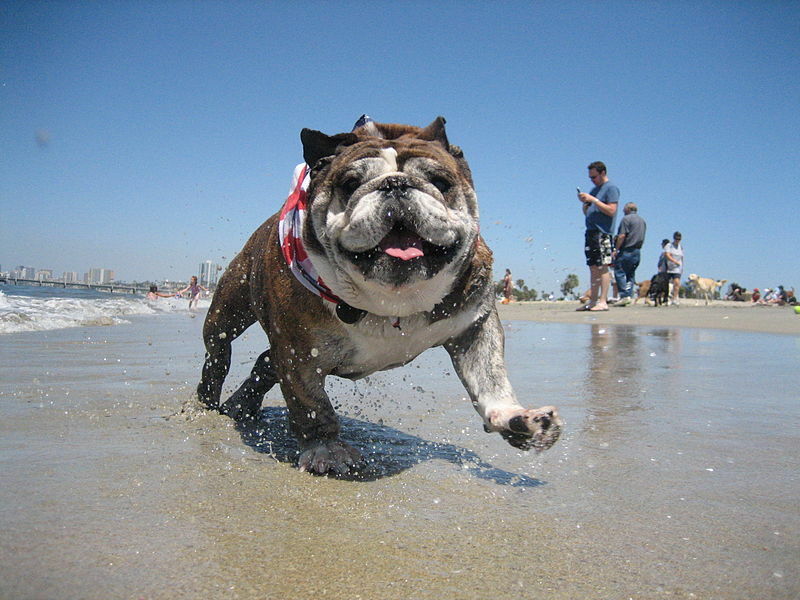 Dogs are the greatest type of life form can you believe that some beaches don’t allow dogs. If it was my rules humans shouldn’t be allowed to go on beaches especially with bathing suits. We dogs love to swim in fact we even invented a stroke called the doggy paddle its already famous its only been around for a few decades. Of course no human could master the doggie paddle like us. Dogs have been swimming way before humans. The beach is now overrun by humans this is bad for dogs this means that theres less place for dogs to swim. When theres less place for dogs to swim theres less place for fetch and many other dog related activites. Earlier this morning right after Blanche the Bulldogs puppy humans had left for school Blanche headed up to her girl puppy human’s room to lie on her warm bed and watch her territory from above. Blanche is very serious about protecting her territory from invaders so when she entered her lookout room she was shocked to see an invader was not just in her territory but in her home. 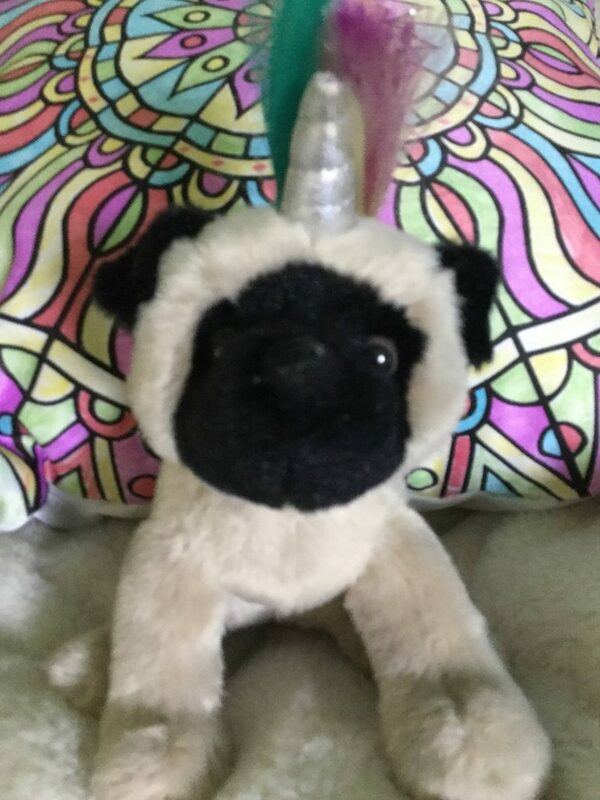 A stuffed pug with a strange unicorn horn and rainbow main was sitting on her soft wight chair. Blanche had never encountered such a creature before so she didn’t attack it right away. She knew that it could possibly have some kind of defense mechanism that it would release if she tried to attack. Blanche knew that if she snuck up behind it the unipug would not be able to defend itself as well unless it had retractable spikes on its back. Blanche bravely snuck up behind the invader and prepared to make her attack. She crouched waiting to make sure the unipug had not spotted her and then with great grace and accuracy she lunged at the unipug and sank her teeth into the back of it’s plush neck. Lucky for Blanche the unipug didn’t have retractable spikes on its back or for that matter any kind of defense at all. Blanche with the invader trotted downstairs to throw the unipug off her territory for good. But Blanches humans did not hear her whimpering at the door so she could banish the invader. When Blanches humans did find her they were the opposite of pleased in fact they yelled at her for a good ten minutes. The worst of all they put the unipug the invader back in her fluffy white chair but out of her reach. The unipug continuous to sit on Blanches fluffy white chair just out of her reach. “I’ll get that little creature someday.” Said Blanche. “But for now I must be patient, that little invader has to come down one of these days. If you want to know all about babies I’m the pug to talk to. I know everything about babies because I have had to put up with not one but two of them! They pull your ears, rip your fur out, and grab your tail every time you walk by. They are intent on making my life as miserable as possible. (Just like sisters). The only things that got me through those dark times was the thought of them growing up and leaving, and chicken. I like chicken. The babies that live in my house have many methods of making my life miserable. First they steal all the attention from me and my sister Loretta. Well that’s not true. Loretta still gets lots of attention from Man, but Lady is the one that gives me attention and she’s much too busy with the baby. Once they were both so busy that they forgot to let me outside, and I pooped in the kitchen. Another way that the babies have made my life miserable is by messing up my sleep schedule. I need my rest or else I get oblivious to what’s going on around me, and Loretta can sneak up and sit on my head before I realize she’s there. The babies don’t seem to appreciate my personal problems though because they scream all through the night so I barely catch any z’s at all. The worst thing yet about babies is that they don’t eat real food. They eat gross mushed up stuff that smells like dried fruit. Even I don’t want to eat that stuff when it drops on the floor and I’ll eat anything. (I eat it anyway though because if I do it insures I’ll make it to dinner without passing out from hunger). As you can now see the meaning of babies is to steal all the attention from you, keep you up all night and drop food for you that probably isn’t even edible. Hopefully one day they’ll grow up and drop lot’s of chicken for me. I like chicken. It was a bright and sunny morning at Bethany Beach Delaware (Blanche the Bulldog’s humans favorite spot to vacation) and Blanche and her grown female human were taking a nice relaxing vacation walk. They had just arrived home when Blanche smelled something in the air that made her nose tingle. Could it be? Yes it was the smell of chicken, and it was very close. Blanches grown female human (also known as Lady Charge) made the mistake of removing Blanches harness before they entered the house. (It was a mistake for the humans anyway not for Blanche). And Blanche smelling the wonderful aroma of chicken took off in search of it. Blanche knew she must reach the source of the wonderful chicken sent before another dog or animal got to it so she ignored her humans cries of “Come back!” or “No” and continued her run in search of the chicken sent. The sent was very close now, Blanche put her nose to the ground and sniffed. She followed her nose until she found the source of the delicious aroma. 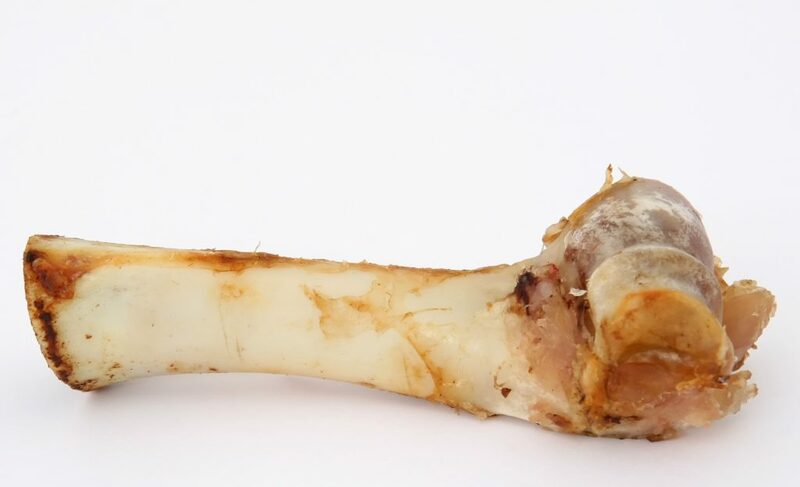 A chicken bone with some meat still on it! 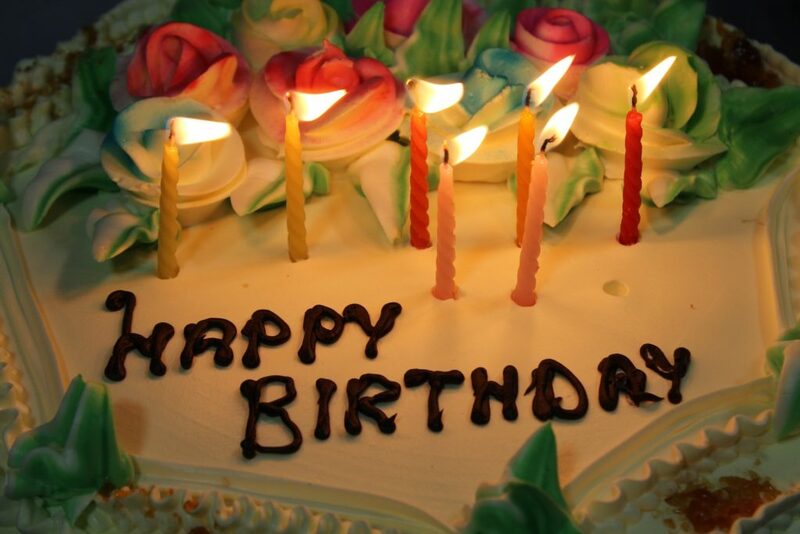 To Blanche this was a miracle, it wasn’t every day that she got so lucky. (Blanche’s humans didn’t feed her very much chicken because they think it will make her quite plump). Blanche snatched up the chicken bone but she couldn’t enjoy it yet, she had to make it past her humans who had surrounded her. Blanches humans chased her around and around trying to grab her. (lucky for Blanche and her humans this event occurred on a dead end street so nobody got run over). They finally did manage to grab her by the collar and remove the bone from her mouth (but after many unsuccessful tries). Blanches humans took her back inside and they remembered to only remove her harness once they were inside so that this sort of incident didn’t happen more than once. (Unfortunately for Blanche). Do you have a very unintelligent, stinky, cross eyed sibling? Or at least one who needs showing who’s boss? Well if you do I feel your pain Baby. Lucky for you the Baby Girl is an expert on showing siblings who’s boss. In fact I have to do this to pug brother every day. Pug brother is very easy to boss around because he doesn’t have very many thoughts of his own. (Or any very good ones anyway). The Baby Girl has a pretty good idea of what’s going on inside that pugs head. “I want to eat some of my own poop, I hope dinner is soon, I like chicken.” Anyway siblings are usually not that bright so you should start showing them who’s boss right away. There are many ways of doing this, pushing your sibling off the bed, taking his favorite bone, or my personal favorite sitting on his head for extended periods of time. You should also keep in mind while bossing your sibling that they may try to stand up to you. Pug brother has only attempted this once or twice because when he did I made sure he understood that he doesn’t get a say by sitting on his head. I recommend that if your sibling tries to stand up for themselves as well you should try the Baby Girls technique. (It worked very well on pug brother, he hasn’t ever tried to defend himself again). As you can now see showing your sibling who in charge isn’t as hard as it may seem if you follow the Baby Girls pointers, and very soon your sibling will know who’s the boss. If you want to know all about laps I am the pug to talk to. I know everything about laps because they are one of my most favorite things in the whole world. They are not better than chicken though. I like chicken. Laps are very comfy to lay on when you are tired after a long day of eating and waiting for food and more eating. My favorite persons lap to lay on is the Lady’s. Her lap is the best because Man is always getting up so I can never get comfy on his. The best laps to lay on are the big ones because there is more room. 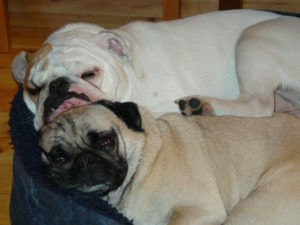 I have tried laying on little laps like the small boy and girls but they are much too small for a pug like me. I have sat in many humans laps over the years and think of myself as an expert on determining which are more comfy and in my opinion bigger tends to be better when it comes to confort. My sister Loretta knows that I love laps so that is how come she made it her mission to never let me have any lap time. Whenever I am snuggling with the Lady she jumps up on the couch pushes me aside and makes the Lady give her all of the atition. She also told me that if I snuggle with the Lady she will sit on my head for an hour as punishment. Sometimes when Loretta is not looking though the Lady lets me sit on her lap anyway. As you can now see the meaning of laps are to be a warm, comfortable place for a pug like me to rest his head after a long day. Laps are one of the most wonderful things in the world if you ask me. But not as wonderful as chicken. I like chicken.